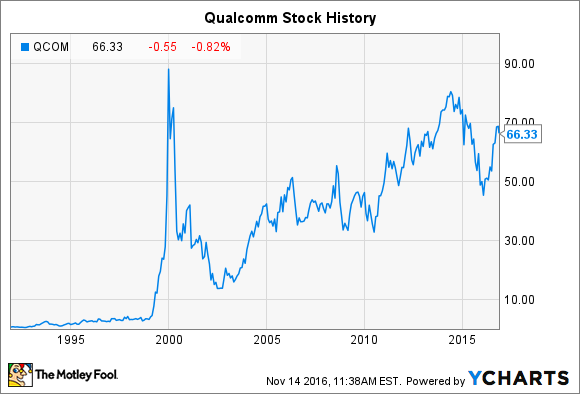 Thanks to Qualcomm's history helping build our mobile world, the stock should continue its longstanding performance streak for years to come. Few semiconductor stocks have a history of performance as impressive as Qualcomm (NASDAQ:QCOM). The chip giant played a central role in developing the wireless technologies and standards that underpin much of our mobile communications today, helping to create two incredibly profitable and complementary businesses at Qualcomm. As you can see below, this, in turn, drove incredible performance in Qualcomm's stock price since its initial public offering -- before factoring in the company's equally impressive track record of dividend growth in recent years. Though you might not realize it, much of today's interconnected mobile world might not exist without Qualcomm. The San Diego-based semiconductor power played a leading role in developing what became the 3G and 4G LTE mobile standards, and the company's history is a fascinating narrative of technical expertise and long-term vision. Founded in southern California by seven colleagues in 1985, Qualcomm partnered with the U.S. military to develop mobile communications technologies. A number of important innovations followed, including Qualcomm's demonstrating the first CDMA cellphone call in 1989 (the first-ever cellphone call had been placed by Motorola in 1973). Qualcomm conducted its IPO in 1991. In 1999, the United Nations accepted Qualcomm's CDMA 3G technology as an industry standard, laying the platform for the incredibly profitable IP-licensing business model that accounted for 73% of Qualcomm's earnings before taxes last year. Qualcomm went on to play a pivotal role in the mobile revolution, becoming the world's largest mobile chipmaker (according to researcher iSuppli) in 2007, when it introduced the Snapdragon processor. Data source: Qualcomm Investor Relations. Few companies are able to sustain these kinds of above-average growth rates for even five years. Qualcomm's ability to average over 20% annual growth for the past two decades truly speaks to the power of the company's product offerings, market leadership, and highly profitable business model. And though its days of breakneck growth probably lie in the past, Qualcomm still seems poised to deliver strong returns in the years to come. To be sure, Qualcomm's more recent history has featured its shares of ups and downs. The company nonetheless should remain a key beneficiary of the mobile revolution for a few reasons. For starters, Qualcomm continues to aggressively develop new chipsets that figure to become mainstays in smartphone and tablets. That isn't to say Qualcomm won't face challenges, such as Samsung's ascendant Exynos mobile chips, but its current suite of IP and its research and development chops should allow the company to stay at or near the top of the mobile chipset space well into the future. Qualcomm also continues to bolster its product portfolio by pursuing a sensible mergers-and-acquisitions strategy. The poster child for this dynamic is NXP Semiconductor, which Qualcomm agreed to purchase for a whopping $39 billion earlier this year. NXP Semiconductor's exposure to several important aspects of the Internet of Things, arguably the most impactful tech trend and investment opportunity of the next decade, makes it a new crown jewel in Qualcomm's product portfolio. At the same time, though, Qualcomm's once-ironclad business model has endured some stresses in the past few years, particularly on its profit-center IP-licensing division. For context, several Chinese smartphone OEMs avoided paying Qualcomm the licenses they contractually owed the company for its patents on 3G and 4G connectivity, which clearly threatened to undermine Qualcomm's entire licensing business model. After some protracted legal wrangling with Chinese regulators, Qualcomm reached an antitrust settlement in February 2015, and it has more recently signed new licensing deals with many Chinese OEMs. The results have already been borne out in Qualcomm's earnings reports, where Qualcomm's licensing business saw revenue growth resume in the most recent quarter. However, the fact that Qualcomm's critical profit driver was challenged is an important risk factor that any investor examining the company needs to understand. Otherwise, Qualcomm appears quite attractive. Given its strong product mix and sensible acquisition process, Qualcomm should be able to grow at somewhat above-average rates for the foreseeable future. In fact, the average sell-side analyst expects Qualcomm to grow its earnings per share at about 10.5% annually for the next five years. Combined with its 3% dividend and management's demonstrated commitment to dividend growth, Qualcomm's price-to-earnings multiple of 17 looks like a fair -- very fair -- price to pay for one of the semiconductor space's strongest names.